I’ve seen a number of specialized clients for the iPhone launched recently that boast the ability to access a WebCenter Content instance from your favorite mobile device. I haven’t explored all the features of these but it occurred to me that there’s a much simpler and standards-based way to do the same thing – via WebDAV. The Oracle / Stellent Content Server has had WebDAV (Web Distributed Authoring and Versioning) support for many generations and it’s what I use to connect my MacBook to a WebCenter Content instance in the absence of an OS X desktop client. 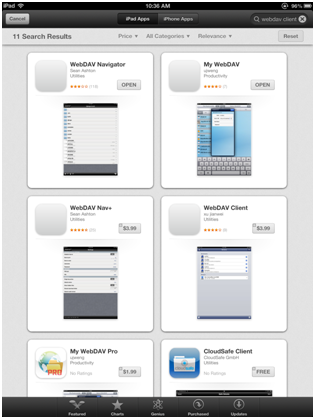 There are a number of WebDAV clients out there for the iPad. I use WebDAV navigator because it’s free and it works fine and may try the paid version next to see what additional functionality it adds. 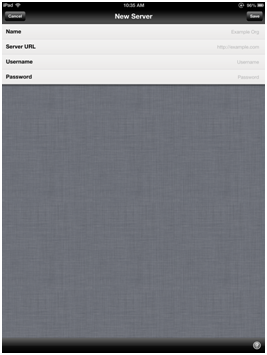 I’m sure there are plenty of options for Android and other mobile devices, too. Setup couldn’t be easier – simply add the server name, URL, username and password (HINT – if you have the desktop client installed, these are the same values – for most servers they are http or https://<servername>/<relative web root>/idcplg/webdav/ ). And you are done – now you can browse contribution folders and projects on the WebCenter Content server, download content and even upload on the run. No special client required! UPDATE – in response to some questions internally at TEAM, here’s some more information on downloading, uploading and workflow. 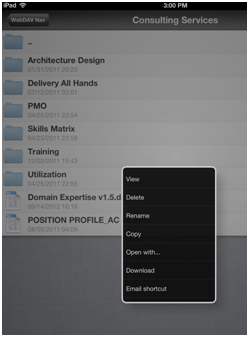 Downloading is easy from within the application and will store the downloaded doc in a local storage area. Remember, the iPad is not really designed to accommodate content storage outside of applications, but this allows you offline storage of items if required. Uploading is more complex because of the limitation of local storage mentioned above but you can download a file to local storage, edit it with Pages and then upload it again (as a new revision). The client also allows you to upload photos directly from the camera or from the “camera roll” of stored pics – great for that snap of the whiteboard at the end of a meeting. 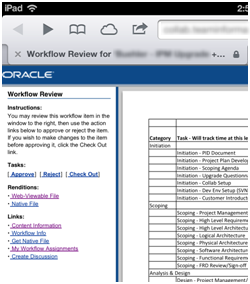 Workflow isn’t covered by WebDAV standards, but the Oracle system has always had great integration with email and that works just fine on the iPad. 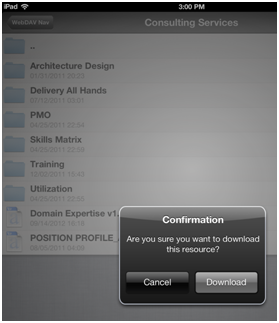 Enjoy integrating your WebCenter Content on-the-go without a specialized app. 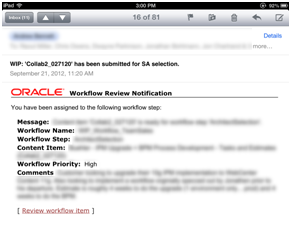 This entry was posted on Monday, October 8th, 2012 at 1:58 pm and is filed under Oracle, WebCenter Content. You can follow any responses to this entry through the RSS 2.0 feed. You can leave a response, or trackback from your own site.